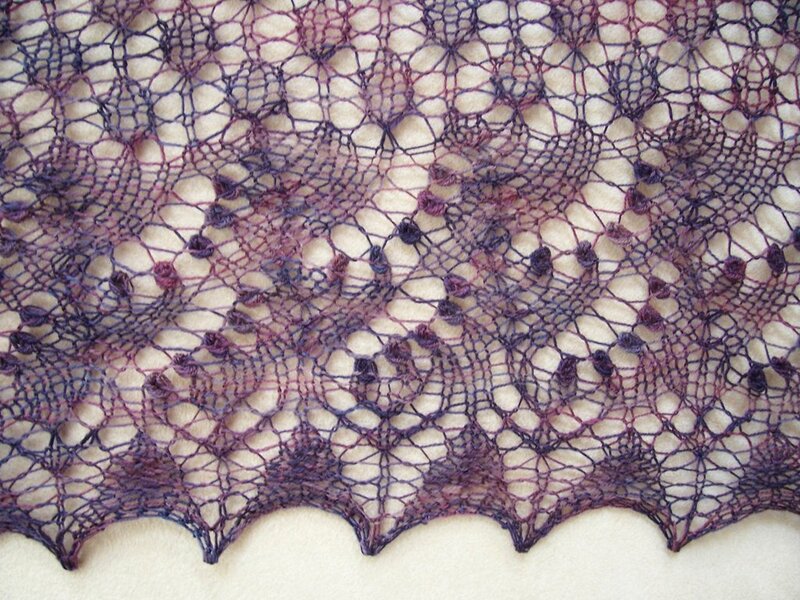 Alianne's Blog: Swallowtail Shawl Finished! Thank everyone for all the kind comments on the Faux Russian. Blogger doesn't always email me everyone's comments so I'm sorry if I didn't respond to everyone personally, but I really did appreciate all of them. The Faux Russian really was a fun knit. This was another fun knit which didn't take long at all. Measurements: Pretty much what's given in the pattern; I'm really too lazy to find it right now and look. You may remember that I started the Trellis scarf (also a nice pattern) with this yarn, but then saw this pattern and frogged. I'm glad I did. I think the yarn and the pattern really complement each other. It's really light and elegant. You may notice that the Wool Peddlar's Shawl is now in the sidebar. I'm coming clean. I really can't justify calling it a swatch anymore. Beautiful! You knit that so fast. Look at you go! The shawl is fabulous and you were right to change. Beautiful! That one is on my "to do" list. You did a tremendous job. It looks so lovely. Wow - that is so pretty. I was going to give up making that shawl, but after seeing yours I want one. Yours is really beautiful in that yarn. You did that so fast, too! Oh wow, this is beautiful, and you call that a quick knit? That's so beautiful! 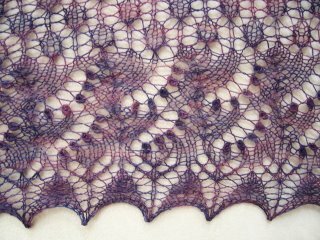 I can't wait until I have some time to finally start some lace. Wow. That is completely stunning - and perfectly purple!! Congrats!! 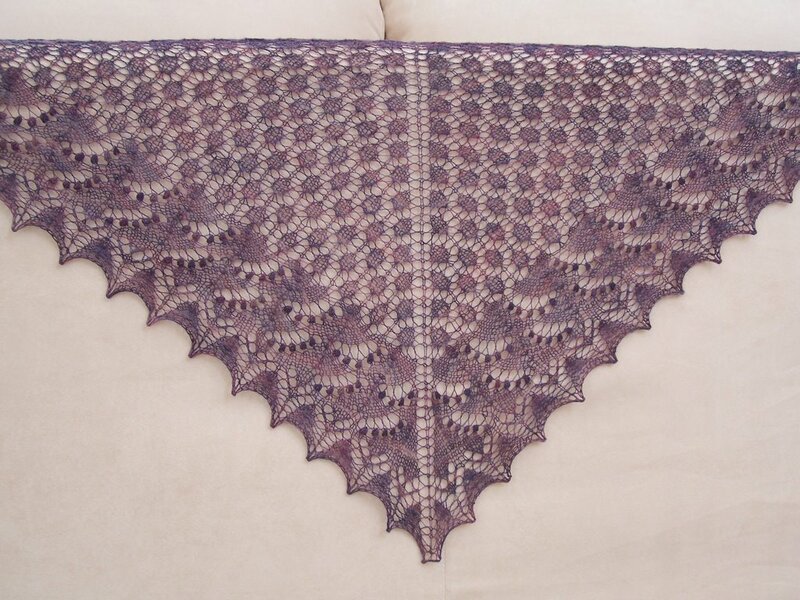 Beautiful shawl, can't wait 'till I get my magazine, I hope it will turn up in my mailbox on Monday. Fantastic! I'm NEEDING this shawl. You made the right decision switching to the Swallowtail, it's so pretty! I love the yarn too. Oh that is just sooo pretty. I love the edging. Thanks for the great pictures of it too-they do it justice. oh man, that's gorgeous as well. Beautiful~ I love the detail in the border. I think you meant "Fall 2006" issue of IK instead of Winter 2006.
love the two-tone color, it adds so much depth to the finished shawl. hope it's giving you much joy after the trellis-ripping incident. perfect pattern for the yarn and nice blocking job. What a perfect choice for the yarn! It's beautiful. this is so pretty. and u knit like the wind. Beautiful! Now I want to make this one too. What a beautiful scarf. Of course this will be added to the list. My hands like the small and/or lught stuff now. Thanks for posting your beautiful pictures. What a beautiful Shawl - it's just lovely and the color is so nice! Yours is the prettiest one I've seen. I started mine in Zephyr, but if I do another one I am going to use cashmere. I can't believe how delicate and beautiful yours is! Sorry about the "anonymous" comment..I hate that! It's just that I didnt' see the "other" option. Gosh, that is a stunner. Swallowtail is another must. Beautiful! I hope my Swallowtail looks as nice as yours. It's the most beautiful Swallowtail Shawl I have ever seen!